The Gasparilla Music Festival in Downtown Tampa is approaching! 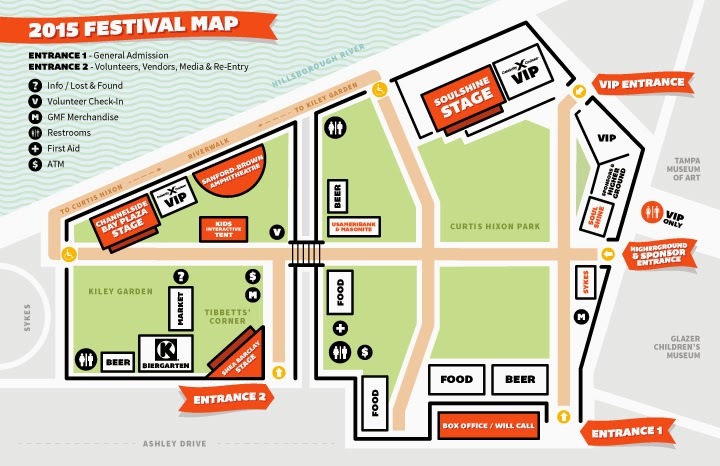 The 2015 festival will take place in Curtis Hixon Riverfront Park and Kiley Garden Park on March 7th & 8th and will feature musical acts from a wide variety of genres on several stages including Modest Mouse, Gogel Bordello, The Gaslight Anthem, Trampled by Turtles and many more. Along with tons of great acts, there is also an amazing lineup of restaurants making an appearance. You can check all food offerings at Gasparilla Music Festival by clicking here but I wanted to highlight on some of my favorites not to be missed. I have two Sunday General Admission Tickets to giveaway. Comment below letting me know what you are most looking forward to seeing at the 2015 Gasparilla Music Festival. Make sure you enter through the Rafflecopter Widget below. 8:00pm DALE EARNHARDT JR. JR.
11:30am DISNEY’S CHOO-CHOO SOUL WITH GENEVIEVE! SINGLE AND 2-DAY GA & VIP TICKETS AVAILABLE HERE. Hourly parking is available in various city-owned and private lots. A limited amount of on-street parking is available throughout downtown. On-street parking meters north of Kennedy Blvd. are free on weekends. It's very convenient to park in Ybor City or Channelside and hop on the streetcar. A one-day unlimited ride card is just $5 and includes city buses. The streetcar begins Saturday service at 11 a.m. Get off at the Whiting Street Station and you’ll be just Three blocks from Curtis Hixon Park. Click here for the Streetline Car Map. As part of its mission to support and promote music and education, the organization is involved throughout the year in several initiatives including providing scholarships to music students.